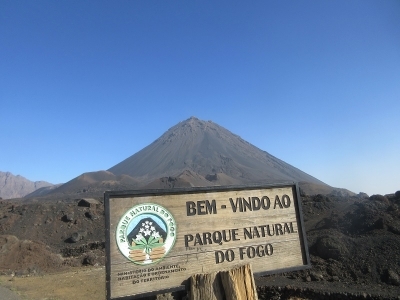 Parc Naturel de Fogo – Chã das Caldeiras is part of the Tentative list of Cape Verde in order to qualify for inclusion in the World Heritage List. The island of Fogo is quite small, but it has the highest peak of Cape Verde, active volcano Pico de Fogo. The volcano and its surroundings (with natural boundaries of its caldera) are protected as a national park. Although the landscape is moonscape-like and, at least at the first glance, not friendly, due to mild climate and rich soil people always lived in the caldera, planting coffee and grapewine. They even developed original rounded houses, made from volcanic materials and called funco. Unfortunately, happy life in the caldera is frequently interrupted by eruptions of smaller peak of Fogo (Pico Pequeno). The last one took place in 2014 and lasted for four months. It was very slow so people had time to leave the village taking everything valuable. Although almost all buildings were covered with lava and destroyed, immediately after the eruption the inhabitants came back and started constructing new houses, literally “level up”, on top of the remnants of old ones. The landscape of the village and surroundings is really outstanding and one of the most memorable ones in Cape Verde. It is also one of the best examples of human adaptation to difficult conditions near volcanoes. If caboverdian government emphasizes this cultural aspect, I would cheer them on success of the nomination as a WHS.